You're not just getting married and perhaps gaining some new children in the process or bringing a new spouse into your life -- your children are gaining a whole new family through your marriage. Making them feel like they're part of the decision-making process is a great way to start things off on the right foot. It's not uncommon for my clients to have been married before. No shocker considering the divorce rates worldwide. But most divorced people don't stay single forever, and many celebrate the launch of a second marriage with as much public enthusiasm as they planned their first. Once upon a time, people were discreet about second weddings and the rules said a bride couldn't wear white the second time around. Those rules are gone and almost all my brides have worn white (in fact, the only ones who've skipped a traditional wedding dress have been first-timers eloping). As more couples are celebrating with big weddings for second marriages, more weddings include children from the previous marriages. Sometimes it's just one child involved in the process, but frequently there are enough of them handy to make "Brady Bunch" jokes. I can honestly say I have never had a child of any age at one of our destination weddings who was not happy to see the marriage taking place. That is a relief because I'm not sure how I would handle the emotional side of that (I'm not a therapist and I'd be afraid of doing more harm than good with the best of intentions). And yes, it would become my problem if the situation was serious enough to upset the bride or disrupt the wedding weekend activities. I consider my company blessed that we've only dealt with happy tots and teens. But I have noticed that the more involved the kids are in the wedding festivities, the happier they appear to be on the actual wedding day. There's no rule about how to involve your children from previous marriages in the wedding -- the only guideline should be that you don't force them to do something that makes them feel uncomfortable or disloyal to their other birth parent. But I've never encountered that to date, so I'm going to stick with the happy side of things and give you some ideas of how you can involve them in the process so that they feel like they're part of the new family the marriage is creating. 1. Let them help with the planning if they're old enough. If you have teenagers, get them involved in choosing the music for your wedding reception. They have to listen to it too, and you want them to dance and have fun. Just the other night, I made a funny and sarcastic remark to the teenage son at a wedding about my love of country music (not) and he told me that he's a huge country fan, just like his parents (he meant the bride and groom). Cracked me up because he looks like he walked off the cover of a One Direction album, but apparently, he's a big Johnny Cash fan too. And when some of the songs came on, all four of the children (the bride and groom each had two from a previous marriage and they have already blended the two households) were out there boot-scootin' with the parental units and their friends -- and having a blast doing it. Props to mom and dad (aka the bride and groom) for making sure their party would feel inclusive. 2. Let them invite friends. While this suggestion has to be age appropriate, I think it's brilliant to let your tween daughter or teenage son bring a friend along if you (or the friend's parents) can afford it. Not only does this take pressure off the parents to keep everybody entertained, but it gives the kid a support system if he or she needs somebody to lean on. Older children who do support the marriage don't want to share any misgivings with their parents on their "big day," and having your bff there (who already knows exactly how you're feeling) is the best way to help prop them up without anybody else knowing about it. 3. Involve them in the actual ceremony. There are so many ways to involve your children in the wedding that it's hard to choose. Most obviously, asking them to act as bridesmaids or groomsmen is a huge honor. But that's not the only way to do it. I've seen sons walk mom down the aisle to give her away, and I've seen even younger boys act as Best Man and be trusted to hold the real rings (makes me cringe and smile at the same time as they promise me they won't fool with them or take them out of their pocket until the minister asks for them). Artistic children have helped create the ceremony décor, and the musically-inclined have provided the ceremony processional or recessional on everything from a guitar to a recorder. 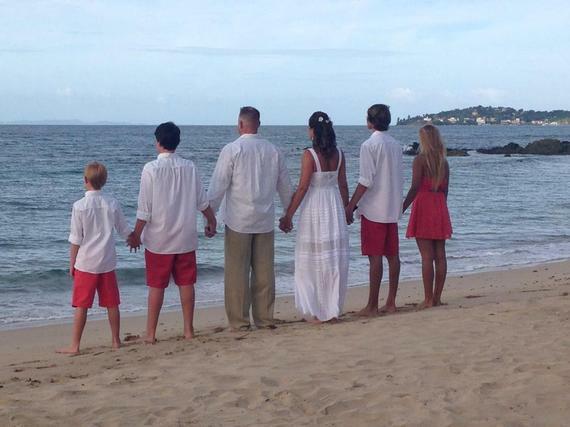 Readings -- especially about family -- can be poignant coming from one or more of the bride and groom's children. But just be careful to give each and every child a special role so that nobody feels left out. 4. Create an event within the actual ceremony that demonstrates the new bond being created. 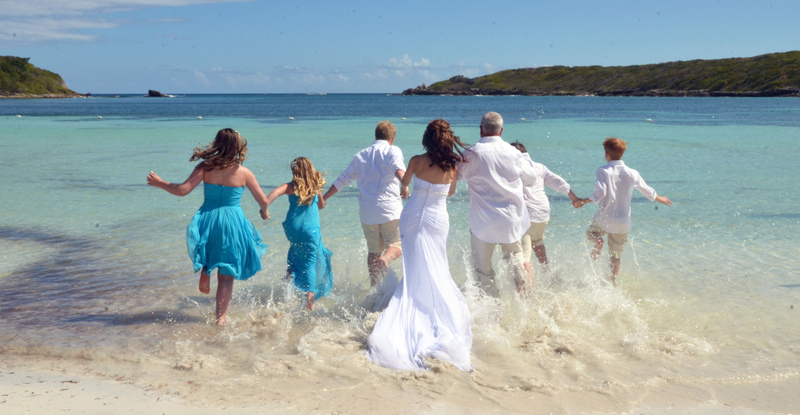 The most popular way to do it is with a sand blending ceremony, but there are other methods of sharing the actual vows with your children. I love it when newly-minted step-parents make vows to their new step-children promising to love them and be there for them forever, no matter what might happen. It's also touching when the children make vows to each other to become brothers and sisters of the heart, regardless of blood. These are the moments that bring everyone to tears but are the most important and memorable when life gets tough. 5. Give children an opportunity to have a real role in the reception. How you go about this depends entirely on the age of the child -- you probably don't want to ask someone beneath high school age to give a toast unless they've requested the honor. In one case, a young future pastry chef was involved in selecting the wedding cake and proudly helped conduct the ceremonial activity around the formal cake cutting. With smaller children, having a special dance where the new parents dance with their new children can be precious. A giant "trash the dress" experience where the whole group jumps in the ocean or swimming pool together can be a hilarious way to bond as well, and makes for fabulous pictures. Celebrate the presence of children at a wedding where families are being joined and blended. Remember, you're not just getting married and perhaps gaining some new children in the process or bringing a new spouse into your life -- your children are gaining a whole new family through your marriage. Making them feel like they're part of the decision-making process as well as the formalization of the bond is a great way to start things off on the right foot. Until next time, happy wedding planning from Weddings in Vieques!